NEW YORK (AP) Luka Doncic is about to become an NBA player, though he’s unlike the other top prospects who will be drafted. He’s already a pro. He’s already a champion. And he might just be the most accomplished and intriguing player in this class. After capping his brilliant stay in Spain with another title, the Slovenian guard heads the list of international players expected to be selected Thursday, a teenager whose resume is already more complete than even some of the most season veterans. 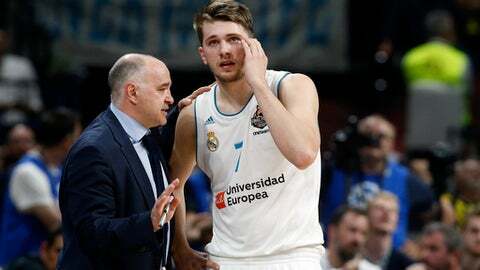 Doncic couldn’t join Deandre Ayton, Marvin Bagley III and the other headliners in New York on Wednesday because he was en route from Spain after finishing off his dream season by helping Real Madrid win its ACB league championship Tuesday. The 6-foot-7 guard made a 3-pointer off one leg with the shot clock running down and Real Madrid clinging to a three-point lead, and his team held on to win the series in four games and allow him to get to Barclays Center in time for Thursday’s festivities, rather than stay behind for a Game 5. He had already been the MVP of both the Euroleague season and its Final Four, the youngest player ever to win both honors, as Real Madrid won that title as well. The Phoenix Suns have the No. 1 pick and are widely expected to draft Arizona center Deandre Ayton, even though new coach Igor Kokoskov coached Doncic last summer on the Slovenian national team that won the nation’s first EuroBasket gold medal. Then it’s Sacramento, Atlanta, Memphis and Dallas, and any of them could consider a player who’s only 19 but has been playing against some of the toughest competition outside the NBA for years. And while there may always be some skepticism of European players because Darko Milicic bombed so badly after being taken right behind LeBron James and ahead of Carmelo Anthony, Chris Bosh and Dwyane Wade 15 years ago, it would be a surprise if Doncic failed after all he’s already done. Even with Ayton, a native of the Bahamas, and Doncic at the top of the list of international candidates, the strength of this draft is at the college level. Power programs such as Duke (Bagley and Wendell Carter Jr.), Michigan State (Jaren Jackson Jr. and Miles Bridges), national champion Villanova (Mikal Bridges and Donte DiVincenzo) and Kentucky (Kevin Knox and Shai Gilgeous-Alexander) could have multiple players taken in the top 10-15 selections of the two-round draft, and teams looking for point guards could choose between freshmen Trae Young of Oklahoma and Collin Sexton of Alabama. They could give the NBA a second straight strong rookie class, after Utah’s Donovan Mitchell, Boston’s Jayson Tatum and 2016 No. 1 pick Ben Simmons of Philadelphia all helped their teams advance to at least the second round of the postseason.